Bananas are high in potassium, add volume, and are a healthy source of natural sugar. I enjoy preparing quick, healthy snacks without adding sugar. Raw fruit is a healthier choice, and satisfies my sweet tooth. The following recipe uses only ripe bananas and milk. 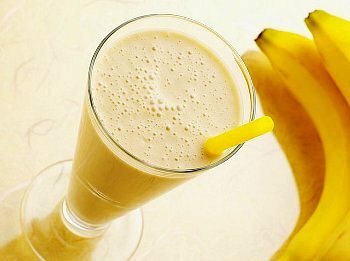 If you prefer a very thick shake, use 2 or more bananas. The more ripe the bananas, the sweeter the drink. Pour cold milk into blender. Break or cut the bananas into the milk. If the fruit is really ripe, you won’t need to cut it, saving yourself time washing a knife. Blend ingredients. If you prefer more froth, blend more. Done. Drink. Posted on July 21, 2012, in Food, Recipes and tagged Banana, Fruit, healthy snacks, milkshake. Bookmark the permalink. Leave a comment.